I have to agree with mark, that seems to be a lot of tire for the size of motor you have. only time will tell, should dyno 65 +, also seems the majority ive seen are running 8 to 12 paddle 22s, but dont know weight to power ratios on what i see either. i was running 8 paddle 20s, and it didnt feel like it was enough. and it should be 60 lbs lighter now too. i wont know untill its on the sand i guess, along with 3 diff. gear sets to play with, for a total of 6 diff. combos. from 13/36 to 14/39. 12 paddle would be a glider and the paddles on those are much smaller, I know bikes making more power than that only running 8 paddle haulers. Not trying to give you a hard time just looking out for a fellow racer. i wasnt sure that was going to be as much a factor as the hauler and extreme are identical except the paddle on the extreme is 1/8 thicker for less flex. and thats cool, take all the help i can get. well, if its too much, its just too much, should be easy to get rid of when the time comes. Lookin good so far. We made 67 with a 545 LTR, and it was a ton of work and a ton of money to get there. appreciate it RE, we will see. here is the baseline stock ATP 500BB. 13.75:1 comp. both runs are on the exact same bike, same day. blue is BB listed above. 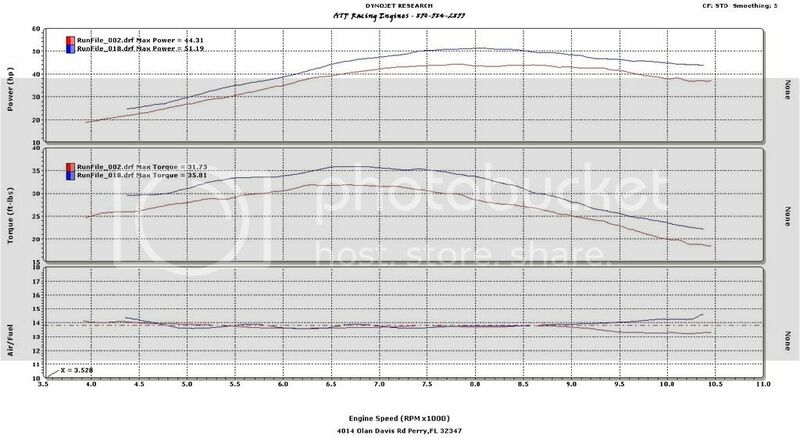 51hp almost 36 tq.////increase of 6.5hp and over 4 lbs. tq. its destined to be in the 60s IMO. diet is working lost another 6.5 lbs in about 20 min. today. Looks like your bike is coming along. Are you going to make it to any of the races? not sure, the next 3 are a little far for me rite now. im jonesing and cant wait to get it in the sand, so i guess we will see. i talked to dustin this afternoon, my TI stem and carbon drag bars will be here next week!!!!!!!!!! im able to get rid of the extremes now, what would you recommend. im considering a 21x11x8 or still the 22, any thoughts to consider would be appreciated. 22" 7 paddle Haulers or maybe some Gliders not sure on paddle count. well, after looking at many suggestions, and trying to find something that would be a good duner and still drag it out, i went with a 21x12x8 7 paddle hauler on a 9x8 wheel. got my Eko Ti stem and Cf bars on yesterday, they are flippn sick, and 1.5 lbs. vs. the stock stem, clamp and bars were 6.4 lbs.